Beatbox, the default music player in the upcoming elementary "Luna" release, has reached version 0.3 codename "Acolyte". The new version includes an improved album view, iPod sync, podcast and Internet radio support, among others. Beatbox features a clean interface with 3 possible views, including a very cool album view, smart playlists, MPRIS v2 support (can make use of the Ubuntu sound menu or various GNOME Shell extensions) Last.fm integration (scrobbling, similar songs, etc.) and more. Better album view, shadows for album covers, native gtk, more integrated, new popup view. Speed improvements to list and album view. Now reads album artist, composer, disc number. 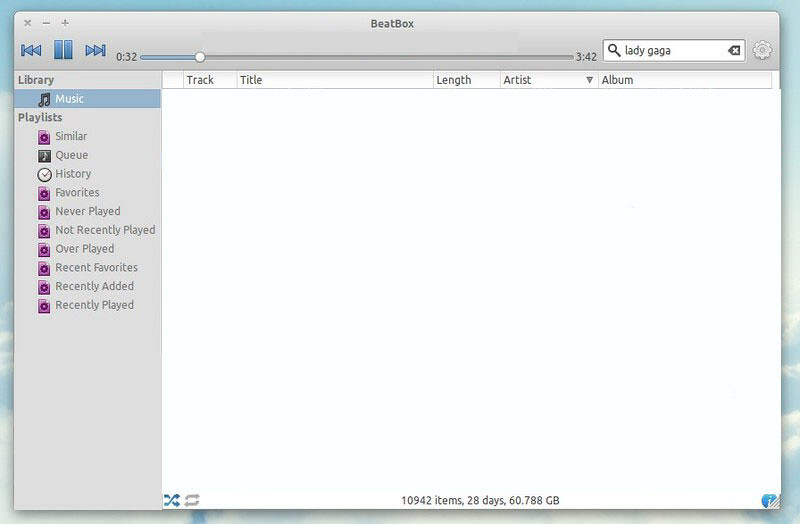 Download BeatBox Music Player (includes Ubuntu .deb packages and source files) - BeatBox requires some dependencies which aren't available in the Ubuntu repositories: SQLHeavy (PPA here) and libranite0 which you can get either from the elementary daily PPA (make sure you read the PPA description before adding it!) or from the Eidete PPA (which should be safer than the elementary daily PPA). No Comment to " BEATBOX Elementary Music Player 0.3 is Released - Ubuntu/Linux Mint "